As readers of International Investment, you will know that this is a title that has always gone the extra mile to bring you expert insight into developments as they affect the international wealth management and IFA community. Now, we are redefining the ‘mile’ itself. That may sound slightly outrageous, but having asked our audience if they would like to receive content in a digital format, which facilitates embedding of audio and video, expanding charts and social network links, the answer has been an emphatic ‘Yes!’. We are therefore not so much beating our own drum as responding to the message that has echoed our way. And this means that we are extremely pleased to be able to respond with the first of our ezines – publications distributed on a platform that allows for greater flexibility in production, and which allow you, the reader, to follow trails of information in ways that would never be possible in print. Our International Investment ezines also align with our web and email presence in a more efficient manner. Further developments are coming, but for now welcome to the future! As International Investment moves from its monthly printed magazine format to its new hybrid digital format, it is hard to think of a better subject to be our Big Interview than that of deVere CEO and founder Nigel Green. Using our new ezine format we have been able to bring you, our readers (and viewers) a revealing video feature packed with editorial exclusives from when I interviewed and filmed Green at deVere's administrative office in Malta. International Investment is proud to have been given exclusive behind-the-scenes access to one of industry's most compelling and often heavily-criticised figures. We hope that you enjoy the results. We also bring you the latest international news – including a video news item regarding RL360O’s plans for further international growth as it makes plans to bed in its recent FPI acquisition. We also have a special report from the Cayman Islands and a look at Standard Life Investment’s MyFolio multi-manager team’s plans for international expansion. With predictions of up to 80% of all online traffic set to be video-related by 2020, one thing is certain: video is here to stay. And here at International Investment we aim to mix this medium alongside traditional online media to bring you the best interviews, features and stories that matter to you. Please use the social media links to let us know what you think. Fullerton Fund Management, a Singapore-based subsidiary of Temasek Holdings with an outpost in Shanghai, has been approved to receive a private fund management licence (PFM licence) from the Asset Management Association of China. With the PFM approval, Fullerton is now able to offer onshore investment products to institutional and high net worth investors in China, Fullerton said in a statement. Furthermore, Fullerton noted that it is the first Asian fund house to successfully register its already-existing wholly foreign-owned enterprise, or WFOE, with the AMAC as a private fund management company. It first established its China footprint in 2007, with a representative office in Shanghai, housing onshore equity analysts. As reported in International Investment on 8 September, the Shanghai-based, wholly foreign-owned enterprise of the London-headquartered, LSE-listed Man Group asset management company has also been awarded a private fund management license by the AMAC. The awarding of the private fund management licenses comes as western asset managers seek access to the relatively untapped Chinese market, even as Chinese authorities seek to stem the flow of Chinese wealth overseas. RL360O chief executive takes International Investment behind the scenes of the FPI acquisition. ​In this special video report, below, from RL360O’s Isle of Man headquarters we speak to David Kneeshaw about the company's recent purchase of Friends Provident International from Aviva. Fidelity International has launched a China Healthcare fund, via its global venture capital subsidiary. The US$250m China Healthcare fund has been launched to focus on therapeutics, healthcare services, healthcare IT/digital health, and MedTec by Eight Roads Ventures, the proprietary investment arm of Fidelity International. This is the fifth fund, launched by the venture capitalist with the first four China funds all including a strong healthcare remit. Eight Roads Ventures, said in a statement that it also plans to launch a China-dedicated technology fund. The China healthcare fund will allocate 40% of the capital in therapeutics, betting on what it believes will be a boom in innovative drugs in China. Beijing has been initiating ambitious policy reforms to invigorate healthcare, part of efforts to meet rising demand for quality medical services. China has forecast total healthcare spending will surge to 8 trillion yuan (US$1.2trn) by 2020, as the country tries to cope with a boom in its ageing population. That has created a number of investment opportunities in the region. Shuang Rongqing, a veteran private equity investor, last month launched a US$150m cross-border medical device fund aimed at tapping into China’s demand for overseas high-tech medical equipment. Hansard International, the Isle of Man-based financial services business, has launched a new online tool to help financial advisers analyse retail clients' attitude to risk, it was announced earlier in September. The software has been developed in association with global asset manager Fidelity International, whose portfolio of products are available through Hansard. The tool works by asking the client ten very straightforward questions that will paint a picture of their attitude to risk when it comes to investments. The answers will generate a risk score, with six different profiles in which the client will be placed, with one completely risk-averse or “cash only”. Are clients attitudes to investment risk changing amid the changing political backdrop? Each of the five other profiles, or score groups, is linked to a Hansard International Fidelity model portfolio with varying degrees of risk. Hansard pointed to the fact that the portfolios offered were selected by Fidelity's multi-asset team, ensuring consistency across the portfolios when comparing a client's attitude to risk, something that is not necessarily the case when comparing similar tools that provide access to portfolios from multiple providers. Zurich has joined together its operations in the Middle East, Isle of Man and its Corporate Solutions (including Zurich Eurolife) as one team. Peter Huber has been named as the new chief executive of Zurich International, Zurich International Life in the Middle East and Isle of Man and Zurich International Corporate Solutions (including Zurich Eurolife). Reporting to Patrick Manley, chief executive at Zurich Insurance plc and chief administrative officer for Europe, Middle East & Africa (EMEA), Huber will work closely with the international business teams in three of Zurich’s key markets, including its largest international market, the Middle East, the company said in a statement announcing the changes. Huber was previously chief executive of Zurich Global Life, Singapore from July 2013-August 2015 before he took over as president of Zurich Topas Life Indonesia from August 2015. Walter Jopp, chief executive Zurich – Middle East will now report into Huber as a result of the changes. Zurich International Life’s chief executive Clive Baker, based on the Isle of Man, is to depart the company after five years at the helm, Zurich has told International Investment. The announcement came on the same day as it was announced that Baker had been replaced by Peter Huber as a result of joining together its operations in the Middle East, Isle of Man and Corporate Solutions (including Zurich Eurolife) into a single entity. More people are now likely to have a claim for bad investment advice in relation to Harlequin investments, following a review by the UK’s Financial Services Compensation Scheme (FSCS). The scheme is already paying claims against firms for negligent mortgage advice and pension-switching where the underlying investment was in a Harlequin resort, the FSCS said in a statement published on its website. As a result, the FSCS said that this paves the way for more people who may have been mis-sold a Harlequin product by their financial adviser to make a claim for compensation. The Harlequin Buccament Bay resort development scheme (pictured above) on the Caribbean island of St Vincent, fell into a series of difficulties and court wrangles that left a large number of investors across a range of products facing prospect of losing some, and in some cases potentially all of their investments. Harlequin has been investigated by the Serious Fraud Office after some developments were never completed. There has also been some controversy about the levels of commission paid to advisers. 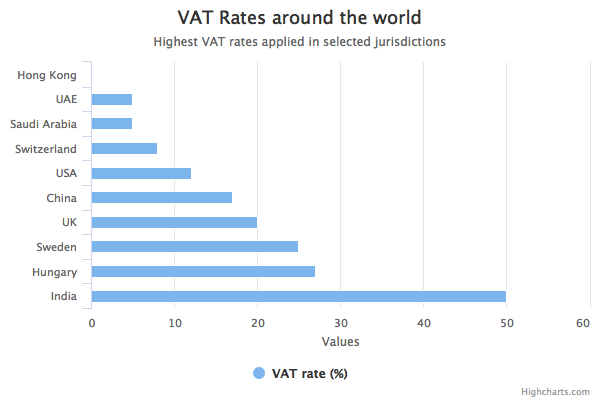 The United Arab Emirates (UAE) is to introduce a value added tax (VAT) levy from January 2018 for the first time — but is softening the blow by setting the rate at what it says will be one of the world's lowest. UAE finance minister Sheikh Hamdan bin Rashid Al Maktoum, who is also deputy ruler of Dubai and chair of the Federal Tax Authority, said the rate has been set at just 5%, low compared with rates in, say, Europe that average around 20% as with the UK. Switzerland at 8% has Europe's lowest, with Hungary the highest at 27%. He described the new tax as becoming "the bedrock" of the UAE's planned taxation system, and revealed that the move is happening in concert with the five other members of the Gulf Cooperation Council — Saudi Arabia, Qatar, Bahrain, Kuwait and Oman — and will be rolled out in tandem across the region. The move is being seen as another step in the development of alternative revenues for the state to reduce over-dependency on oil revenue as export markets look to clean technology and renewable forms of energy. “The new tax system will provide extra support for the government to implement the vision of the UAE leadership and build a diversified and productive knowledge economy,” he added. “The tax will have positive results on the economy given that revenues will be redistributed to development projects that benefit society at large and accelerate progress until the UAE reaches the top of global rankings across all sectors,” said Hamdan. The Ministry of Finance said in a statement that that all supplies of goods and services will be subject to VAT at a standard rate of 5% with the exception of specific supplies for which a zero rate will be applicable. The Mexican government has formally awarded a concession to a new, second stock market, in what is being seen as a bid to generate new investment in the country's businesses and increase the number of investable entities there. In a statement, the company behind the new stock market, Mexico City-based Central de Corretajes (CENCOR), said it would "contribute to the growth and modernisation of the securities market", fueled by "the latest technology powered by Nasdaq". The New York-based securities exchange operator will supply the new Mexican exchange with its X-stream trading platform – widely used by stock exchanges around the world, CENCOR said in its statement. The new exchange is expected to begin operating in the early part of next year, CENCOR added. The new market will be known as BIVA – Bolsa Institucional de Valores – and it is expected to target small and mid-cap companies. The concession to allow BIVA to begin trading was formally handed to CENCOR president Santiago Urquiza by Mexican president Enrique Peña Nieto, in a ceremony held at the National Palace in Mexico City. Nigel Green, is one of the international financial world’s biggest names. An individual that is no stranger to controversy and is certainly not afraid of a fight – he is difficult to ignore. Gary Robinson spent a day with Green in the company’s Malta administrative centre, as the company’s recent comprehensive restructuring period beds in, and found him in a reflective but typically combative mood. Nigel Green is not your typical financial adviser and the deVere Group is not your typical financial advice firm. It is difficult to pigeonhole deVere as it is an international financial firm with its own private bank, mortgage company, investment proposition which also now has an online cross-border e-money app. 2017 has certainly been an interesting and intense year for the firm and for the offshore industry in general – in certain ways it has been even more intense than ever, despite the lack thus far of an event equivalent to last year's Panama Papers scandal. Green, however, looks fresh, relaxed and possibly quite chipper, as International Investment sits down to begin his video interview on the spectrum of business opportunities and challenges as he sees them. So, first up, how does he manage to stay abreast of everything that goes on within the deVere Group and, given the intense scrutiny of financial firms by various financial services regulators, how does he manage even to get to sleep at night? Remarkably, a typical day for Green starts at about 3am, he says: a time that only milkmen and radio breakfast show disc jockeys also rise. So perhaps sleeping shouldn’t be an issue in the evening after such an early start. He has his exercise routines and is working by 4am-4.30am. “I am working across different time zones so this suits me,” says Green. “We have a strong presence in Asia. We go all the way to Australia. The time zones are massive. If I start too late in the day I miss the start of their day and that is the last thing that I want. “So, there, that’s my weakness already,” he adds, smiling. It is now about 9am in the morning and Green has already done five hours work just as the interview gets going. In agreeing to do this Big Interview with International Investment, Green said that he will answer any questions that are put to him – no matter how difficult. And he doesn’t disappoint. While never speaking about individuals or clients – or anything bound up by legal complexities – he is happy to discuss his career to date, challenges with regulators, battles with disgruntled ex-employees and one of his biggest fights, against the US government’s FATCA ‘double taxation for expats’ rule. He is also open and revealing when asked about his personality traits, his strengths and weaknesses and most of all what drives him, on a daily basis. In a challenging year, one of deVere’s biggest hurdles has been the amended QROPS legislation that saw an immediate 25% levy added to pension transfer business from the UK to countries outside of the EU. It was a move that certainly took the industry by surprise. And it was particularly hard on deVere, as QROPS represented about 20% of its business. As a result, Green brought forward a strategic review of the company, which had already been in the planning. The QROPs change could have been seen as a hammer blow to any business reliant on the revenue that it can generate. Indeed, STM, the London-listed cross-border product specialist saw its shares drop on the announcement. Interestingly Green was a major shareholder in that business until earlier this year, when he sold his last remaining 2% stake. He originally acquired a 24% stake for £1.59m in the Gibraltar-based product provider in 2012. In 2015, he relinquished his then majority stake, selling more than 6.7 million STM shares, at a time when the share price was rising. Green added that the sale of his last remaining shares in STM freed-up resources to allow deVere to "concentrate more fully on developing and expanding" its fintech business. It is clear to anyone that Green meets that his new passion is the deVere Vault banking app, which is described as a key fintech development. Indeed, he cannot help demonstrating the app that allows immediate cross-border, multi-currency transfers of cash anywhere in the world, to anyone that he meets. the regulators around the 25% QROPS transfer levy, Green insists that the move has not affected the deVere Group’s focus. He is also happy to discuss how the company is working with the regulator on the 166 notice that was served on deVere and Partners UK LTD [by the FCA] and a host of other pension transfer specialist advisers earlier this year. “It is difficult to give cross-border advice, so I think it is difficult as a financial adviser to look at a different country’s rules. And I am going to say it is difficult as a regulator to regulate cross-border advice. It has been some months since the FCA applied the S166 and, at the time, deVere UK were singled out for a certain amount of criticism in some quarters for the situation. Since then it has been reported that up to 90 or so companies have also been put under the same scrutiny. "The regulator in answering our questions felt that we didn't have the right process. We had taken [at the time] legal advice and our lawyers assured us that the process was correct and they still do but settling the issue has cost a lot of money, Lawyers always do. "Who wrote the law in the first place? If up to 90 different firms misunderstood the rules as well as their legal teams then its clear the rules are perhaps opaque." This is just one example, Green says, of the types challenges in today's world that all financial advisers have to face, particularly those that deal with cross-border advice. "I would certainly would not criticise the FCA or any other regulatory authority in areas in which we operate," he adds. "I don't think they singled us out. The FCA have a duty to do their job just as we have a duty to do ours. Moving on is not an issue for Green. Indeed, it is perhaps one of the things that defines him. As he says. he moves on very quickly from difficulties and arguments onto the next task, without holding onto long-standing prejudices. When it comes to the US government’s controversial FATCA double taxation rule though, he senses the opportunity to stand up on the soap box and is happy to wax lyrical on the subject. There are three large green canvas photographs with quotations displayed on the wall behind Green in his Malta office. One is of Nelson Mandela, the other is of Winston Churchill. The third, perhaps the world’s most controversial figure – current US president Donald Trump. Not adverse to criticism himself, when we spoke to Green earlier this year he was happy to discuss some of the claims outlined in the undisclosed South Africa commission admission row with Moneyweb (on its website there were various individual cases outlined). Since then he also been another court case in the region, involving a row with a former employee leading to a judge ruling in favour of the employee, which the company is now appealing. Once a person crosses Nigel Green, there is definitely a ruthless streak. This is often something that defines him in some people’s eyes. But there are many sides to this individual. “When it gets to that stage [when he is about to part company with an employee], I am more likely to ask you to leave quickly by the window, rather than by the door,” he says. A born-and-bred Eastender (born in West Ham, although he does not reveal the year), Nigel Green is a typically confident and streetwise Londoner. And despite a slim demeanour he appears as if he can ‘look after himself’ if needed. Indeed, when asked whether he has ever felt the need to employ a bodyguard in some of the more dangerous corners of the globe – particularly given his public profile as a successful member of the global financial services community – he explains that he has never really felt that he needed one. One wonders, does he ever worry about kidnapping, for example? To this, Green reveals that he has an interest in martial arts and says that he has had extensive training in how to handle potentially tricky situations involving actual physical attack. This is further confirmed when Green leads a tour through the company’s spacious Malta-based administrative headquarters: it includes popping into the gym, where there is a training dummy for martial arts or boxing training in the corner. Green makes a beeline for the dummy and begins to demonstrate a series of martial arts moves, despite being in his full shirt and tie. It is a fun exchange, but it is clear that he can certainly pack a punch, if called upon. As the interview draws to a close, Green talks about the culture within the deVere Group. “Culture is vital for any company. It is the CEO’s job and then the CEOs of the local businesses to ensure that the culture is right. I don’t allow people to work for me I don’t enjoy working with. “If you don’t enjoy your job, what are you doing? If you want to work for deVere you have got to have fun. We insist on it. Have fun, but be professional and be the best. If laughing is so important. Come on Nigel Green, tell us a joke. Finally, a question that stumps Green, who for the first time is almost lost for words. It might have taken most of the day, but ‘job done’. Like the banner inside Manchester United Football Club states: “Hated. Adored. Never Ignored”. Even the most ardent Chelsea fan would find it difficult not to agree. And that perhaps sums up Nigel Green in a nutshell. The residents of the Cayman Islands were incredibly lucky to escape the devastation of the giant Hurricane Irma recently. But there have certainly been turbulent times politically, particularly during the 2017 Cayman general elections which took place in May. Even after the polls closed, the drama continued at first, as the islands’ politicians struggled to form a coalition government that satisfied all concerned. “The weekend of the long knives” is how some Caymanians were heard to refer to the immediate post-election period, the Cayman News Service noted, as coalitions seemed to form and then dissolve within a matter of hours. It was only after a few false starts that, as expected, Alden McLaughlin returned as premier, his party having taken seven out of the 19 seats up for grabs, and a new cabinet was assembled from a mixture of new and familiar faces. By early June, though, long-time observers said things were settling back into a routine, with few expecting any major shifts in policy. After all, they point out, the Territory's stability over the years, with little social or racial division, that has long been one of its greatest advantages over the various other jurisdictions – both in the Caribbean and globally – that it competes with for tourists, investment, HNW residents and the ever-important financial services sector. In some ways it is remarkable that this tropical British Overseas Territory, tucked away in a trade winds-caressed corner of the Western Caribbean, is consistently rated among the most important financial centres in the world. As recently as 1960, for example, it didn’t have a single bank anywhere within its entire surface area of 260 sq km (100 sq mi). How often do you use offshore investments in portfolio construction? In addition to its stability, deeply-rooted tradition of British common law, tax neutrality, and proximity to the United States – all of which are often mentioned among its other USPs – it is also not a “one trick pony”, as Rawlinson & Hunter, an international accountancy with a major outpost in the Caymans, explains in its promotional literature. Caymanians point with pride to the islands’ role as the domicile of some two-thirds of the world’s hedge funds, with 7,600 entities regulated there. Assets under management total US$2.3trn. More recently, it has been successful in attracting private equity vehicles as well, which now number more than 20,000. This is a move up of 13 places, from 44th place, against five years ago, according to Mark Yeandle, associate director of the Z/Yen Group, which carries out the twice-yearly GFCI research, determining the ranking. That the Cayman Islands has risen in the GFCI ranking reflects, he says, that the jurisdiction’s efforts to raise its game and boost its image, and make a case for using its financial services sector ahead of those of some of its rivals, is starting to be recognised by the marketplace. One way it’s done this has been to participate actively in debates carried out on the pages of publications like the Financial Times, which is widely read by financial services executives around the world. Cayman Islands Stock Exchange chairman and attorney Anthony Travers OBE is one of the jurisdiction’s most outspoken defenders in such situations, often responding feistily on behalf of his countrymen at the slightest suggestion that the Cayman Islands might be anything but squeaky clean. A few days after the Panama Papers scandal broke in April 2016, for example, he responded to press reports of a UK politician’s warning that Britain might have to impose “direct rule” on its “tax haven” territories if they didn’t fall into line with British tax standards by noting, in a letter to the FT, that: “The reason the Cayman Islands do not feature in the Panama Papers is that you would need to be unsound of mind to use the jurisdiction for any form of improper tax structuring”. “Because the British and Cayman Islands governments have set the global standard on the issue of tax transparency, HM Revenue & Customs, the Internal Revenue Service and the tax and law enforcement authorities of all EU jurisdictions, among others, have complete and unrestricted access to all beneficial ownership information on Cayman structures,” he added. Noting that unlike the Caymans, such US jurisdictions as Delaware, Wyoming and Nevada keep no beneficial ownership records at all, he concluded his letter by saying, pointedly, “It is not for no reason that the Panama Papers reveal the increasing use of US corporations”. Nevertheless, one of the difficulties for the Cayman Islands – which is also true of certain other low-tax jurisdictions – is that it isn’t possible to pretend it isn’t a low-tax regime, because it is, in that it doesn’t raise money to fund government in the same way as many G20 countries. There are no income taxes, no corporation taxes, nor are there any capital gains, wealth, inheritance or gift taxes; nor is there estate duty. While this is perceived by its critics as an important attraction for companies and individuals, Caymanians argue that its image as a low tax jurisdiction is actually a “mis-characterisation” that is rooted in the fact that its tax regime, in Travers’s words, “isn’t more similar to that of, say, the US or the UK”. In other words, instead of income and capital gains taxes, it employs instead a system of “indirect” taxation, making use of stamp duties, customs duties, business licences and various fees to raise the money it needs. The fees include work-permit fees, paid by the island’s large expatriate workforce; transaction fees, paid by those active in the financial services sector; and fees levied on tourists who visit the islands. “All Cayman Islands vehicles pay tax in the jurisdiction of investment, in accordance with the laws of that jurisdiction; and investors will do so in their jurisdiction of residence,” Travers told International Investment. Tax haven accusations aren’t the only challenge for the Caymans, of course. Like many other offshore jurisdictions recently, for example, Cayman has seen the number of its banks drop, to 158 earlier this year, well down on the 426 that were present in 2001. The number of active mutual funds licensed in the territory was slightly down last year, too, with a total of 10,586. Among the residents of Cayman, meanwhile, a few issues that have nothing to do with taxes, banking statistics, beneficial ownership or mutual funds have been attracting considerable attention in recent months – particularly among the expatriates who account for more than half of the islands' population of around 60,000. And, some sources there say, some of these issues could have implications for the islands’ financial services industry, which needs to attract and maintain the best people it can to compete globally. Perhaps the most potentially disruptive is a package of unpopular reforms made recently by the Cayman Islands government to its pensions laws, as they pertain to expatriates. Under the so-called National Pensions (Amendment) Law 2016, which took effect on 1 January but which isn’t yet fully in force, foreign workers with a Cayman Islands pension who move abroad from Cayman from December 2017 onwards will only be able to access their money when they reach retirement age. Although this may not seem an unreasonable stipulation for a pension pot, it’s turned out to be highly unpopular among expatriates because it effectively prevents a portability feature that until now has allowed such foreign workers to enjoy early access to the pension savings they had built up while in Cayman, within two years of leaving the island. The reforms have been defended on grounds that they would bring the country’s pensions regime into line with pension regulations in the rest of the developed world. Ahead of May’s election, Cayman Islands government spokespeople stressed that the pension law reforms could change under the new administration. But Cayman Islands sources say that, given the make-up of the coalition government that was ultimately formed after the election in May, change now seems unlikely. Immigration is another matter that has been the subject of some debate in the islands, with a reported backlog of more than 900 applications for permanent residence from long-term non-Caymanian residents said to be a particularly hot issue. Some individuals have filed judicial review actions against the government in an effort to force the process along, according to media reports. Here again, financial industry sources have said that the government’s failure to deal with this issue has been a concern for their sectors, as many of the individuals affected are long-term professionals who work in Caymans’ legal and accounting professions. As in many other jurisdictions, there are issues as well about the way immigration is handled generally, and this, too, is seen as having implications for the financial services industry. Less than two weeks after taking office for his second term as the Cayman Islands government’s leader, in what was seen as a fresh acknowledgement of the importance of the issue, McLaughlin told a press conference that the territory’s immigration problems needed to be sorted out, and that he would see to it that it was done. Additional reporting by Helen Burggraf. With a merger with Aberdeen successfully concluding and a newly launched SICAV version of the MyFolio fund range picking up plaudits, Aberdeen Standard Investment’s Bambos Hambi has good reason to survey the view from his London eyrie with satisfaction. In the world of multi-manager and fund of funds there are few better-known names than that of Bambos Hambi. His specialist style of investing money, by selecting the best managers in the investment funds universe and blending the investments to create portfolios to suit different risk profiles, sounds like a task not too dissimilar to that of an investment IFA. But on closer inspection tracking the performance, movements and strategy changes of thousands of fund managers, is no easy task and takes a safe pair of hands to get it right. And ideally one with experience and understanding of the many variables that make and break fund manager performance across a range of market conditions. With 25+ years of multi-manager experience, the majority of it heading the multi-manager proposition within some of the industry’s biggest players, Hambi has one of the most experienced pairs of hands in the business. The more than £15bn in assets under management in the MyFolio range (including some institutional workplace pension portfolios) makes it clear that the industry also shares this view. International Investment caught up with Hambi and MyFolio co-fund manager Joe Wiggins, who is heading the recently launched SICAV version of MyFolio (alongside James Millard) at the company’s headquarters in London’s financial district. Based in the higher regions of 30 St Mary Axe (often referred to as The Gherkin) we find the pair in fine sprits. One might even say – as our eyes are occasionally drawn across the London skyline – on top of the world. At the time of the interview the dust is settling nicely on the recently approved Standard Life and Aberdeen merger. But, perhaps more pertinently to the international marketplace, the recent soft launch and roll out of the SICAV version of the MyFolio fund range has been “extremely well received”, particularly in the DACH (Germany, Austria, Switzerland) region of investment advisers. While nowhere near the UK figures, the SICAV, which is co-headed by Wiggins and supported by Hambi, is seeing a lot of interest in its first six months across Europe as it builds performance. So why take the Standard Life Investments MyFolio range outside of the UK for the first time? And why now? Bambos Hambi: “We did a lot of work before we launched MyFolio. The catalyst for MyFolio was the retail distribution review (RDR) in the UK. “Recently we noticed Holland has adopted this RDR and it looks like it is being accepted more in Europe and across the world. In the UK the RDR banning of commissions has been instrumental in MyFolio’s growth with advisers charging fees having to segment their client bases which, Hambi says, has meant that lot of their smaller clients has been filtered through the MyFolio proposition. Can that UK success be replicated around the world? BH: “We did a lot of research with advisers and customers before we launched in both cases. “The advisers and the customers were both telling us that the problem they had was the difficulty of choice. What asset classes do you go to? We have 19 in MyFolio. BH: “The customer was also telling us that they weren’t happy, as during the credit crisis asset managers were very good on the way up but were not protecting on the downside. “Across our active range, we include absolute return in two ways: absolute return as defensive – via bonds funds, which is cash plus 2-3% – and we use it as a growth asset as a cash + 5% asset. Bambos Hambi might be the biggest name in the team but how close does the MyFolio team work in the overall fund selection? BH: “Very close. We have 12 (we used to have five in previous teams) and another one joining this month. Using a football team analogy, is it like a Premier League manager with transfer targets? Do you have a top 100, 200 or 400 fund managers that you’d like to select? JW: “We have various filters – does it match the asset class first. That narrows the filters. We do a quantitative screen that looks at risk and reward through the cycle. Is performance good and bad? Is risk good and bad? But we are aware of quant limitations. You mentioned smoothing, which sounds like a nice alternative to the old With Profits, which was very much the Standard Life way back in the day. Would you agree? BH: “It has been described as a more transparent With Profits type of service. We are using more asset classes than the traditional With Profits funds. We use a lot of short duration bonds rather than the conventional bond market and absolute return managers that With Profits didn’t tend to use. “So, yes, but much more sophisticated and much more transparent than the With Profits funds that people may be aware of historically. JW: “Across the range we have different risk strategies from 1-5, so we are invested in riskier assets to a greater or lesser extent. You have funds available that are fund of funds from your own [Aberdeen Standard Investments and soon, once approved to include the Aberdeen funds] range of funds and others that includes the other investment companies as well. Why have a Standard Aberdeen Investments fund of funds when you can have the whole universe? BH: “Believe it or not most of the flow (in the UK) has been into our managed product which is Aberdeen Standard investments. People like active management. And being an internal fund of funds and fettered there is a lower charge. Having Aberdeen funds as well as SLI funds in the range must be exciting? Are manager moves still important and are the star fund managers as important to the fund of funds and multi-manager as they were 15-20 years ago? BH: “It is still very important. We still use the five Ps: Philosophy, process, people, performance, price. “People is the fourth P. People are very important. It is great if we can find a strong team but the biggest cause of turnover is still manager moves. It is often the key differentiator in a fund. Is there a team? But who are the vital people in that team? The Aberdeen Standard Investments' MyFolio fund range is now available as a SICAV for international investors. A podcast version of this interview may be downloaded here. Profile: Old Mutual International provides offshore and cross-border investment solutions for both expatriate and local investors across the world. Old Mutual International is the international arm of Old Mutual Wealth, a leading retail investment business encompassing managed investment portfolios, platform services and a range of financial products including tax savings propositions. Old Mutual Wealth is part of Old Mutual Plc, a FTSE 100 group that provides life assurance, asset management, banking and general insurance. Old Mutual is trusted by more than 19.4 million customers across the world and has a total of £394.9bn assets under management (as at 31 December 2016). Offering: Our award winning propositions, designed around customer needs, are underpinned by a wide choice of investments and online tools, to help advisers monitor and manage the entire investment process for the benefit of their clients. Each proposition is designed to be relevant to the needs of the local market and compliant with the regulatory environment. Because everyone’s needs are different, we don’t sell directly to customers or give advice on our products. Instead we rely on advisers, who understand their clients’ financial goals, to recommend us because of our reputation and the quality of the products we offer.